Infinity Countdown: Daredevil #1 Review – AiPT! A new Kingpin is crowned thanks to the Mind Stone in the hands of a criminal. We can’t have a comics event without tie-ins, can we? It’s Infinity Countdown: Daredevil time! Part of every Infinity Stones event has to get us all caught up on who has what stone, where they currently are, and what they are using said stone for. 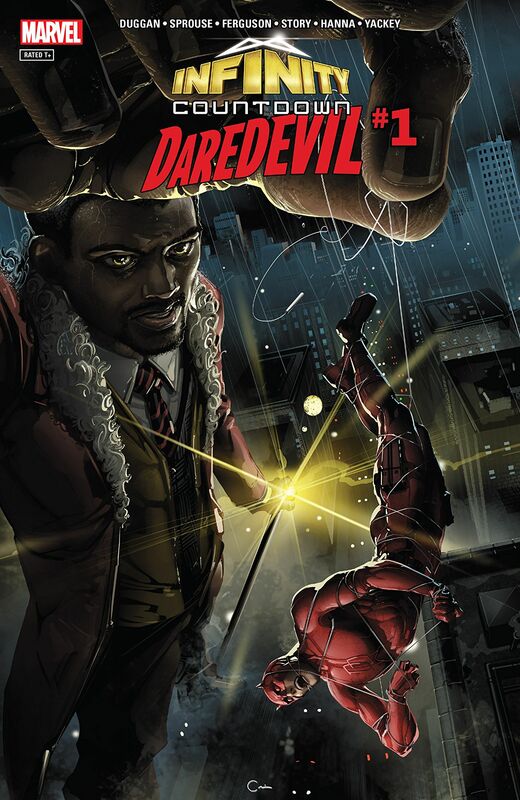 In this Hell’s Kitchen tie-in, Matt Murdock experiences something he hasn’t since the accident that first birthed the Devil: he sees something. Former two-bit criminal Turk Barrett has found himself one of the six Infinity Stones and is currently using it to improve his station in life, so-to-speak. With Kingpin no longer in the picture, a giant hole is left in the New York criminal underground. With sudden psychic powers, including telepathy, Mr. Turk looks to fill the shoes of the crime boss. I have questions. Though Turk tells Daredevil how he got the stone after a couple quick kicks to the face, neither really knows what the stone is. All they know is that, thanks to the dying words of a strange kung fu monk (dying and then shot dead by Turk) who was fighting the Green Goblin outside a strange home on Bleeker Street, that the stone needed to get to the Avengers. Daredevil thinks this is an excellent idea, while Mr. Turk and his compatriots at the top of the elevator shaft vehemently disagree. A quick smack with the staff and an admonition to “forget about my rock,” and Daredevil can’t even see it anymore. He focuses instead on Turk’s rise in the underworld, warning him to stay away from the top spot in NYC. A quick meeting with the man who squealed to Daredevil and a final page appearance by a returning Bullseye brings us into a potentially huge conflict coming with no one truly aware of what is in play. Writer Gerry Duggan has put together a good setup for the future of the upcoming Infinity event, allowing a cosmic story to affect characters on a smaller, more local scale. I’m sure Daredevil not being able to perceive the stone will come up later after a convenient team up. Writer Gerry Duggan has put together a good setup for the future of the upcoming Infinity event, allowing a cosmic story to affect characters on a smaller, more local scale. How are regular folks able to use the Infinity Stones?